Bushtracker Forum :: View topic - PRE-PURCHASE INSPECTIONS/ REPORT AND EXTENDING WARRANTY? PRE-PURCHASE INSPECTIONS/ REPORT AND EXTENDING WARRANTY? WOULD YOU BE INTERESTED IN A PRE PURCHASE INSPECTION WITH 10,000 OR 25,000 KM SERVICE? Posted: Fri Mar 06, 2009 11:18 am Post subject: PRE-PURCHASE INSPECTIONS/ REPORT AND EXTENDING WARRANTY? Remove, Clean, Inspect, and Repack bearings in new grease, and adjust Bearings of course.. Inspect / adjust Wheel alignment. General Overall Inspection under the van. Torque Wheel nuts to the proper settings. 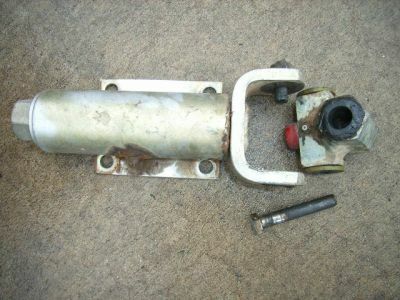 Cost is $595 plus any other parts as discovered..
Great idea Steve. We live in Queensland and it would be a re-assurance to those who wish to our second hand BT - if/when we can ever part with 'her'. Steve, what about the folk with more than 25,000km on the van? Obviously no warranty would be involved, but a pre-inspection would be great. Have sold second hand cars with NRMA or RACQ inspection and each time the cars were sold very quickly. Wherrol we head to next? Warranty is not kms... I don't know where you got that idea... It is just that you first should get a 10,000 Service, and the 25,000 after that is only if you have not been into severe duty like corrugation and bulldust and off-road and through rivers... OK with that? Hi all - Yes, think it's a brilliant idea with the "warranty" and sorry, I don't know how to "vote"...... dumb with computers I guess. Okay okay, just went back to the top... and now see how to vote. Dahh. why do you not transfer the warranty? How does this disadvantage Bushtracker? why should it make any difference? This sounds absurd? Well, maybe if it was a perfect world your viewpoint would have merit. But it is not a perfect world. We have people that are just off on a Sabatical, or just out here for just a year, or don't listen to our advice and drive too hard and too fast and don't let the tyre pressure down and some flog the living HELL out of their Bushtracker. Some do not let tyre pressure down, break all of our advice, run batteries too hard, abuse equipment, drive too fast, drive to float their vehicle on the corrugation beating the living daylights out of the van, and then try and blame it all on Bushtracker. Luckily rare, but it does happen, some out of abuse, some out of neglect, some out of ignorance... We will not cover warranty on intentional abuse or neglect, it states it right on the paperwork. The point is, we deal with warranty with the Original Owner, and how that person treats the van, based on the track record we have with them. We are not going to extend warranty to a new Owner who may be buying a van that has been abused when we have a long track record of history with the original Owner beating it up. Luckily this is a relatively rare situation, so we are going to offer this extension of warranty, but only on the guidelines listed above, after our service and inspection of the Bushtracker here. I mean we really get the odd Character now and then. I had one hard traveller come in that wanted a bearing Service. I enquired as to how long it had been, and he said he had done about 80,000 kms WITHOUT SERVICE only tightening up the bearings Castle Nut. I told him he was already very lucky to have gotten that far without siezing a bearing or snapping an axle stub, and there was a 95% chance the bearing were ruined (like for sure).... And he would need a full replacement set and we would not open it up unless he was willing to replace them as we could not put bad bearings back in. He proceed to decline the service and take it away... Get the picture Damien? Warranty extension will only be done by the guidelines listed above. I have given the exact sort of examples that have happened, names removed... Now you know the nitty gritty of why.. OK? It is an 18', about 6 years old, and on our inspection we noticed that the hitch had an original AT-35 with the smaller 1/2" pin in the pivot point. Luckily the Owners came in for a Service and on our Inspection we picked it up. Read about the Hitch Evolution and Upgrades in the TIPS ON UPGRADING SECOND HAND BUSHTRACKER... There is a heavier version of this hitch available, in a six bolt configuration, and a new hitch coming that is even better and easier to hook up..
Got back to Alice Springs yesterday after buying my second, second-hand BT. Had the service and pre-purchase inspection carried out by Bushtracker and I'm extreamly impressed with the committment that Steve and all the staff have towards their product, regardless as to whether you purchase new or second-hand. Could you let us know where Pre-Purchase Inspections can be arranged for in N.S.W and Vic.? Fantastic post and suggestion, When I sell a car it has a dealer service which is given to the buyer along with the roadworthy cert. If I sold my BT it would have been treated as above so the new owner has no combacks if they abuse the vehicle then try and blame me.